With new banking licenses all set to be issued to private sector players and non-banking financial companies, it’s the advent of a new era! The germination of an idea, the exchange of thoughts, and emergence of a solution – how often do we get the opportunity to witness thought leaders and policy makers in action? However, the students at Symbiosis School of Banking & Finance had the phenomenal opportunity to witness the action first-hand when in collaboration with Mint, SSBF hosted the Conclave on 9th October,2012 – an event that brought together the stalwarts of the banking industry to debate and deliberate on the new equations that would transpire after the entry of industrial houses. 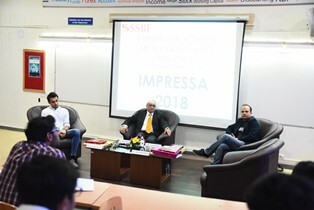 However, this surprisingly was not even the best part – the best part was the conclave being presided over by Mr. Anand Sinha – the deputy governor of the Reserve Bank of India, who addressed the gathering, enlightened everyone about RBI’s viewpoint on licensing and even interacted with students at end of the session. The event saw the heavyweights of the banking industry alighting the stage to debate the pros and cons of licensing, how soon it should be implemented, whether the current banking landscape is ready for such a change and how many licenses should actually be doled out. The list of illustrious panellists included Mr. Naresh Takkar, Managing Director, ICRA; Mr. Ashwin Parekh, Partner National Industry Leader, Global Financial Services, Ernst and Young; Mr. D. Sarkar, CMD, Union Bank of India, Mr. Hemant Contractor, Managing Director, State Bank of India; Mr. Shachindra Nath, Chief Executive Officer, Religare Enterprises Ltd; Mr. Nirmal Jain,CMD India Infoline; while Mr. Tamal Bandyopadhyay, Deputy Managing Editor, Mint was the moderator for the conclave. Mr. Takkar was of the opinion that we need not wait more to issue new licenses, however there is absolutely no room for differential licensing of any kind. He also thought that this licensing window should not be a one-time window, it should be kept open and adequate licenses should be given out -citing 10 to begin with as a good number. Mr. Nirmal Jain concurred with statement and vehemently championed the cause of brokers too stating that the licenses should be on tap and the window not to be open and shut. He too wanted the licenses issue to begin with immediate effect where the threshold should be minimum net worth and there is no differential pricing. Mr. Shachin Nath too agreed that the regime should begin in the next 9-12 months, licenses being given to 5-6 players to start with and survival of the fittest thereafter. However Mr. Hemant Contractor had some reservations. He put on record that he was not afraid of the new competition and he also denied that SBI and other public sector banks had failed in their duties to spread financial inclusion. However, he stated that the licenses should come in to effect only after requisite amendments to the Banking Regulation Act, and opined that looking at the current scenario only a handful of players – 3-4 to be precise – would be eligible to actually get hold of licenses. Mr. Ashwin Parekh was sceptical too. He stated that the Indian banking framework was not suited to licenses for industrial houses currently and it would take a minimum of two years to bring it to scratch. He also said that 2-3 licenses were to be given out every 5 years and there was no room for differential licensing. He was of the opinion that banks derive their strength from the size of their balance sheet and this was a key area to be looked into. Mr. Sarkar too, like Mr Contractor stated that his bank encouraged competition and had no fear of the new entrant, he too agreed that it was unfair to expect the PSUs to perform miracles overnight and spread banking access to the entire country – the banks had broken ground and were still working at it. No learning can proceed in a vacuum, and this is true especially for the BFSI. 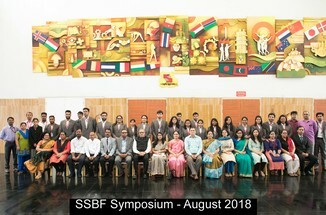 In SSBF’s tireless efforts to bring together academia and industry, we at Symbiosis School of Banking and Finance organized and hosted the Banker’s Conclave on July 25th, inviting eminent bankers and industrialists, to interact with the students and share insights on issues crucial to the business and banking worlds. The 25th of July saw a large group of eager participants, including interns of RBI, College of Agricultural Banking, from University of Boston and New Castle University, and students from Symbiosis Institute of Business Management. 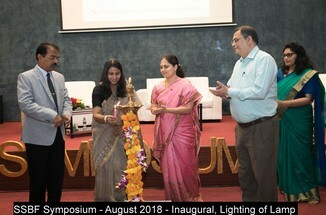 The event commenced with the lighting of the ceremonial lamp, and with the welcome address by our esteemed director, Dr. Manisha Ketkar. Any growth that a country bears witness to is perhaps meaningless if that growth cannot offer meaningful impact to all the people of the country. In this context, the idea of financial inclusion has gained significant traction as a means of ensuring that as many people as possible can partake of the benefits of a burgeoning economy. This has particular importance in India, where 60% of the rural population is still unbanked. Recognising the importance of this issue, Financial Inclusion was made the first topic of discussion during the Banker’s Conclave. The participants were introduced to the concept of financial inclusion through a short film, put together by the SSBF’s creative team, which explained the minimum requirements of financial inclusion, and showcased some of the efforts of SSBF’s Institutional Social Responsibility team in bringing financial inclusion and literacy to the underprivileged. The discussion began with insights from the panel, each member noted for their efforts in bringing together everyone into the financial system. The panel was moderated by Professor Samapti Guha, from TISS (Tata institute of Social Services), who noted that while great strides were being made to solve the issue of financial exclusion, not enough work has been done to understand the problem itself. India has been a frontrunner in improving financial solutions, but the aspect of Social, Institutional and Psychological Exclusion merits further research. Mr. Muthuselvan, Faculty at RBI-CAB opined that India had made significant advances in this field and that the bank-led model of financial inclusion suited India, due to the presence of robust and tight regulations. While telecom-led or other-entity-led models were successful elsewhere, India’s strength lies in this model. In addition the introduction of Agent Banking models and Business Correspondence models has made significant inroads in addressing the problem. In addition, banks, in being allowed to liberally open centres in 2-6 tier regions has given them incentive to expand and improve the reach of financial services. Mr. Muthuselvan also pointed that basic consumer rights needed to be maintained even in the face of financial inclusion. Mr. L. M. Deshmukh, General Manager, Financial Inclusion, Bank of Maharashtra, took the thread of the discussion and highlighted a few key statistics in India’s March towards financial inclusion. Nearly 16.71 crore have been accounts have been opened, however 50% of them alone have commenced operations. He also spoke of the importance of credit penetration, and the inclusion of overdraft facilities for over 80 lakh accounts. The importance of biometrics is not to be underestimated. He was optimistic that three to five years might be all India needs for financial inclusion. Mr. Vaibhav Peshney, Assistant Vice President, YES Bank explained his organization’s approach to financial inclusion, wherein, they managed to gain a foothold by using credit services as a means of financial inclusion. He expanded on how financial inclusion isn’t an obligation but an opportunity for banks to expand their markets and their customer base. YES Bank’s banks partnering with SHG was a strategy that helped them increase reach, without having to rely on branch banking. Thus, alternate delivery channels needed to be looked into, and the best way to bring more people into the system was to help fulfil their needs. The discussion moved from the panel to the audience, who took the opportunity to acquaint themselves better with Financial Inclusion. Some light was shed on how easy it has become to open an account, using minimal KYC norms for the excluded sector, and how it could be possible for moneylenders, and other financial agents outside of the financial system itself to partner with the banks and improve penetration of financial services. The first half of the Banker’s Conclave was a very insightful session and added valuable perspective on Financial Inclusion. 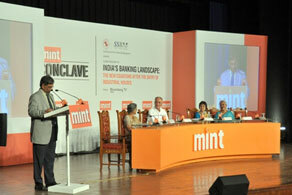 The afternoon session of the Banker’s Conclave tackled the idea and implications of Corporate Social Responsibility. With the inclusion of mandatory CSR, through the Companies Act, as well as companies taking note of the many benefits of giving back to the community, CSR has become a topic of study and discussion, and thus, a very interesting avenue to explore during the Banker’s Conclave. The session began with an explanatory short film, compiled by SSBF’s Creative Team, explaining the concept of Corporate Social Responsibility, and highlighting the growth in CSR activities in India. Prof. Girish Agarwal from IRMA opened the discussion, noting that while CSR has been gaining popularity, companies shouldn’t invent theories to implement change. Research on the issues they wish to address is crucial, he felt. CSR should not be disconnected from the value chain improvement process, and information asymmetry should be reduced. He also stressed on the need to cultivate the right mind set towards CSR. Mrs. Leena Deshpande, Head of CSR, Bharat Forge Ltd. Pune, spoke of the soft aspects of CSR, and how it goes beyond the boundaries of mere philanthropy. She also highlighted Bharat Forge’s CSR initiatives, which included promoting sports and sanitation in schools. Employee involvement was a key factor of in the success of these CSR initiatives. Mr. Zubin Kabraji, Regional Director, Pune, Indo German Chambers of Commerce, explained that CSR can be implemented in many shapes and forms, for example, research on alternative energy sources, and how the Indo-German Chambers offers advisory services for the many German Companies operating in Pune. He also spoke of initiatives by Indo-German Chambers of commerce around the world, including development of competency centres, CSR training in Malaysia, Reporting activities in South Korea and how these led to positive impact on the community. Mr. Srinath Komarina, Senior Vice President, YES Bank, Mumbai highlighted work done by YES BANK which has improved the life of the community around them, and explained how CSR had its merits even in the pragmatic view of running a business and making profits. In case of YES BANK the initiatives led to improved business and greater sustainability. Further, he highlighted YES Bank’s practices to improve sustainability, such as triple bottom line accounting, facilitating responsible investments, and investing in Green projects. Mr. M. N. Sanyal, Head of CSR, Thermax Ltd. Pune, shared Thermax’s CSR initiatives, including the practicing of employing clean energy technology, and Thermax’s emphasis on improving education facilities in India, especially in government schools. He spoke of how, even without being envisioned as such, the CSR initiatives helped in brand-building for Thermax in the local community. In his view, the participation and contribution of employees is what elevates CSR from charity, to a catalyst for positive change. During the question hour, the audience was curious of the Company Act enacted recently in India, which asks Corporate entities to set aside at least 2% of the post-tax profit for CSR related activities. The full implications of the Act are yet to be fully realised, and it would be interesting to see how it impacts Companies in the future. The impact of CSR is best summed up in Mr. Srinath Komarina’s words- “The business of business is more than business.” And as the students of SSBF make their way into the world of business, these are words we shall remember. The event was very well received by all the participants and other invitees in the audience. The invitees also enjoyed a campus tour and were pleased with the hospitality and other arrangements. Staying true to our vision, this was one of SSBF’s many endeavours towards becoming a leading centre for financial studies. Symposium on INDIAN FINANCIAL SECTOR AT CROSSROADS, CHANGING PARADIGMS. 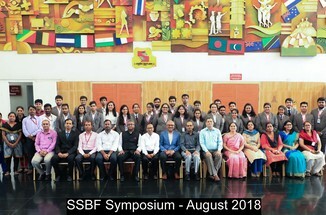 18 th August is marked as the Foundation Day of Symbiosis School of Banking and Finance(SSBF) and on its 8 th anniversary this year, SSBF organised the Banker’s Conclave, an annual academic symposium, on the theme: INDIAN FINANCIAL SECTOR AT CROSSROADS, CHANGING PARADIGMS. The guest of honour for the symposium 2018, Ms. Mona Gupta, a senior public policy specialist with DIFD (Department of International Development) and Ministry of Skill Development and Entrepreneurship, shared her experience and views regarding the current banking structure and importance of artificial intelligence in the coming years. She started by saying, “Money is an instrument and banking is a tool.” She further added that the value of money differs from person to person, i.e., it depends on how an individual perceives it. The banking industry is linked with economics, credit growth, fintech, derivative market and most importantly, money. The discussion then moved from the importance of banking sector to the kinds of threats the banking industry is exposed to. Security is a big issue in the industry as the information provided to the banks can be manipulated/ fabricated. Thus, cyber security is an emerging field in this sector. Because of huge non-performing assets, strategic debt restructuring can be a solution to get rid of stressed assets. She mentioned cyber threats, partnerships and digital products as prospects in the industry. She also spoke about the employment opportunities that will happen due to artificial intelligence. The BFSI sector, aviation sector, construction sector and tourism sector are some sectors that require more skill. Focus in all the above sectors is on inclusivity and women’s participation. Thus, all the sectors along with the banking sector have a huge scope in terms of jobs and contribution to the growth of the economy. There were four panelists for the discussion and one moderator. Mr. Sunder Ram Korivi, a senior consultant with the National Institute of Financial Markets, was a moderator. The first panellist was Mr V.G. Kannan. He served as the managing director of the state bank of India and has more than 30 years of experience in the banking sector. The second panellist for the discussion was Mr. Ramkumar Subramanian. He is the associate director of PWC’s financial risk and assurance department and has more than 10 years of experience in the domain of financial services. The third panellist was Mr. Ashok Gautam. He is the executive vice president and head of financial institutions group at Axis Bank. The fourth panellist for the discussion was Mr. Shashikant Ramchandra Bhavsar. He holds the position of deputy general manager at National Banking Group. Finance is the only sector where the raw material and the finished product both are same, i.e. money, as said by Dr. Sunder Ram Korivi. Because of this problem there is a financial dilemma regarding the lending and borrowing of the funds. The question he asked to the panel was, from where and when did the problem start? The Indian economy is a cash economy where less than 18% of the transactions are done through banks which again create a problem. Public sector banks are losing their market share as their credit growth remains considerably lower than the private sector banks. Gross NPAsratio of the public- sector banks continue to rise as restructured assets turn NPAs. Capital to risk adjusted ratio of certain public-sector banks is at critical level thus government is coming up with reforms like capital infusion to meet the BASEL 3 requirements. It is because of the infrastructure sector that NPAs are rising. The companies in the real estate sector borrow money to take up new projects and are not able to payback which leads to non-performing assets. The public-sector banks are exposed to corporate banking more than retail banking.According to one of the panelists it is important for the public-sector banks to concentrate more on retail banking rather than corporate finance to rebalance their business activities. The discussion was then moved to credit skills an individual would need understanding the human behaviour, study industry trends, location, type of industries and credit models. The panellists agreed to a point that the banks need to clean up their balance sheets, access the capital market for long term loans and accept correspondence banking. The discussions in the second half of the day revolved around ‘Small Finance Banks: Innovativeness and Sustainability’. 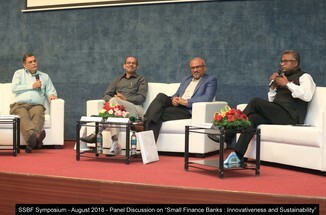 It featured a highly accomplished panel of guests who are some of the biggest names in the field of microfinance- Mr. Narasimhan Srinivasan, an independent director of Equitas Small Finance Bank; Mr. Bharath Sondur, executive vice-president, Suryoday Small Finance Bank and Mr. Jolly Zachariah, COO( West Zone), Ujjivan Small Finance Bank. The discussion started by talking about the history of each of these banks, which in turn led to discussions about the history of microfinance and small finance itself. They discussed about the difficulties such institutions faced in their inception stage- most of it owing to the apprehensions of bureaucrats regarding the need and sustainability of such businesses. The most important part of the discussion was when they explained how microfinance institutions differentiate themselves from other financial institutions- by serving the section of the society that was generally perceived to be ‘non-bankable’. That also happens to be one of the biggest reasons behind their success. They also spoke on how the success stories of Bangladesh and Kenya helped in the evolution of these systems in India. The session came to an end with a number of very insightful questions from the students which were answered in great detail by the panellists. Overall, it was a highly informative and enlightening experience for the audience. The learning from the session was immense and it provided insights to the students regarding the various opportunities that lie in the field of microfinance. On Saturday, 9 th December, 2017, Symbiosis School of Banking and Finance held its flagship event- “Symposium 2017: Decoding the landscape of BFSI”. Our Chief Guest and chair for the event was Ms. Savita Gupta (CFO, India Post Payments Bank). In her inaugural speech, Ms. Gupta spoke about major changes taken place in the BFSI sector, such as Demonetization and implementation of the Goods and Services Tax. She also talked about the rapidly changing technology that is affecting the BFSI sector such as congruence of finance and technology (Fintech) in various finance companies and banks and the Bitcoin “Bubble”. There were two panel discussions during the event and the topic for the first discussion was “Financial Ecosystem in the Digital Era”. For the same, the panellists were Mr. Prakash Joshi (Business Head - ATM Services, Electronic Payment and Services (P) Ltd.), Mr. Sourabh Chatterjee (President, Head – IT, Web Sales, Direct Marketing, Digital Marketing, Bajaj Allianz General Insurance Company), Mr. Javier Gonzalez Nuñez (Head of M&A department Business Associate– Spain & Belgium, Udyen Jain Associates), Mr. Parijat Garg (Vice President, CRIF High Mark), Mr. Kishor Pradhan (CEO, Global Trade Consultancy Services). The moderator for the event was Mr. Parijat Garg. He began the discussion by talking about the fast paced technology and how it might someday lead to the extinction of ATMs. He continued the discussion by talking about how the demand for ATMs had fallen during demonetization due to lack of hard cash. He also talked about how we could do so much more than just surpass ATMs in the digital era that is upon us. Mr. Javier spoke about the electronic payment systems and e-commerce brands like Paytm (that are yet to be launched in countries like Spain and Belgium) that have spread across the country following which India might actually go cashless one day. He also talked about the gap prevalent in India between the rich and the poor people i.e. people who use financial services and people who don’t and technology was only going to widen that gap which can only be reduced by education. Mr. Kishor and Ms. Savita talked about how India is emerging as a digital economy at a fast pace. Financial players can leverage these platforms to venture and develop new business models in an attempt to increase revenue margins. They also spoke about crypto-currencies like Bitcoin that are changing “the game” and whether or not it is safe to invest in them. Mr. Sourabh spoke about how the BFSI sector is more “customer-centric” now and how going digital is a need of the hour for India but digital for the sake of it would not always work. Some of the other topics discussed during the event were “Will ATMs vanish over time?”, How banks are more “customer-centric” now, Can artificial intelligence really replace humans and several other topics. The discussion ended with a Q & A session from the audience and the event gave everyone an opportunity to contemplate the various aspects of the BFSI sector and left everyone with a thirst for learning more. The discussion was highly informative and truly enlightening for the students, teachers as well as others who had attended the session. The second session of the Symposium was structured around the topic “Growth through Innovations” The chair for the discussion was Ms. Savita Gupta (CFO, India Post Payments Bank). The discussion was moderated by Mr. Pankaj Setiya, (Deputy Manager & Member of faculty, RBI CAB). The panellists included Mr. Suresh A. Shan (Head of Innovation & Future Technology, Mahindra & Mahindra Financial Services), Mr. Prasad Deshpande (Vice President, PNB Gilts.) and Mr. Atul Kumar (Deputy General Manager, HR, Union Bank of India). Mr. Pankaj Setiya commenced the discussion by delivering a brief presentation on the topic, wherein he talked about the “GAFA” (Google, Apple, Facebook, Amazon) world that we live in, and that these companies could be the Fintech leaders of tomorrow, adding that we are in the stage of “Digital Darwinism”, where the customers will have access to the best of the financial products. He also articulated that the digital transactions have surged drastically from 11% in 2013 to 38% in 2017, and that there is a huge opportunity for the financial institutions to provide credit to the SMEs that are the major contributors to the nation’s GDP. The panellists held that customers are looking for one-stop solutions. To address this, Fintech companies are collaborating with those shops where footfalls are quite high, so that acceptance of e-payment modes rises. However, they ruled out the possibility of India becoming an entirely cashless economy, as long as the rural India doesn’t accept digitisation wholeheartedly. The discussion was also centred on data mapping, which can be effectively deployed to analyse the consumption patterns of the consumers, and design financial products accordingly. However, they held that emotions, rather than electronics, are a pre-requisite to the success of digitisation. This was subsequently followed by a Q&A session. The key takeaways from the session included evolution of banking and finance from a product- centric to a customer-centric industry, crucial roles of Blockchain and Fintech in digitisation, and Artificial Intelligence (AI) that can be judiciously employed to slash the operational costs for the banks and create new jobs for the workforce. The session gave the students an insight to the tremendous opportunities awaiting them when they make their foray into the world of banking and finance. The Guests of Honour for the event were Mr. Sarat Malik (CGM, Securities and Exchange Board of India) and Mr. Pramod Kumar Panda (CGM and Principal RBI CAB, Pune). In his inaugural speech, Mr. Malik spoke about the various guidelines SEBI has introduced for investor protection, rate cuts done by RBI and how India is now moving towards a cashless economy. The symposium had two panel discussions. The first topic of discussion was on “Disruptive Innovation” from 11:15 A.M. to 1:00 P.M. The chair for the first panel was Ms. Mudeita Patrao (Head Digital, HDFC AMC). 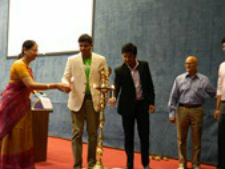 The moderator was Mr. Muthuselvan (Assistant General Manager, RBI CAB, Pune). The panellists included Mr. Ravi Srivastava (SVP & India Head, Jones Lang LaSalle), Mr. Vikrant Nagre (Cluster Head, HDFC Bank Ltd.), Mr. Kanchan Kulkarni (Regional Manager, ICICI), Mr. Ram Aparaj (Senior Manager, Staff Training College, Bank of Maharashtra) and Mr. Muralidharan R, (Group Head – Operations and Information Technology, L&T Financial Services). The second panel discussion was from 2:15 P.M. to 4:00 P.M. on the topic “Changing Facets of Risk Management Strategies.” The chair for the discussion was Mr. Pramod Kumar Panda. The moderator was Mr. Biharilal Deora (Advisor, AIWMI). The panellists included Mr. Bhaskar Niyogi (Head Enterprise Risk and Policy, RBL Bank Ltd.), Mr. V. Hans Prakash (Head, Business Development, IL&FS Securities Services Ltd.) and Ms. Jayna Gandhi (Founder and CEO, Quant Mac Financial Services LLP). Upholding an ethical culture in banking is critical because of its importance to regulators, banks, employees and customers alike. Banks being the custodian of public money, it is crucial to be ethical. Observing the law is one basic professional requirement for banks. They must pay close attention to moral concerns in order to make the right ethical decisions on a day-to-day basis. Banking ethics are the moral or ethical principles that certain banks choose to abide by. Core ethical values include honesty, integrity, fairness, responsible citizenship and accountability. In that light, business ethics means choosing the good over the bad, the right over the wrong, the fair over the unfair, truth over lie. In light of the dynamic and debatable scenario of BFSI sector today, it is evident that ethics are of supreme importance in this sector. On 1 December, 2018, Symbiosis School of Banking and Finance (SSBF) organized Ethicon 2018, a new initiative by SSBF on ethical practices in the BFSI sector. The panelists for the discussion were Mr. Pankaj Dahibhate, Ethics and Compliance Leader, India Operations part of Global Ethics and Compliance Team, Cummins India; Dr. Anita Shantaraman, founder of www.ethicsindia.com; Mr. Vivek Vasudevan, Risk Management Trainer; Retd. Col. Dilip Sopori and Prof. Dr. Ashish Mukund, Vice Principal in Accounting and Taxation at BMCC, Pune. The moderator for the day was Mr. Girish Joshi. The event began with a welcome address by Dr. Manisha Ketkar, Director, SSBF, in which she stressed that ethics is knowing the difference between what one has a right to do and what is right to do. Following this, the discussion commenced with the key point made being that ethics is not a sector specific concept. It must be present in all sectors of industry and in all walks of life. The panelists shared their experience from the industry and brought out various incidents during their career in which values like honesty, integrity and loyalty played an important role. They discussed how culture is essentially a an outcome of ethics practiced individually and collectively. Today, organizations have introduced the concept of whistle blowing which empowers individuals to bring unethical practices to the management’s notice. The panelists encouraged the practice of whistle blowing, while also throwing light on the different protections available to whistleblowers. With growing sensitivity towards unethical practices, the corporates have very little tolerance towards unethical misconduct. Prof. Dr. Ashish Mukund explained that rules are basically spun around principles, which also form the base for ethics. Taking the discussion forward, Mr. Pankaj Dahibhate talked about the role of independent directors. There may be situations where there comes an ethical dilemma but if one has the right principles in mind, one would not go wrong ethically. Talking about a company’s urge to find a shortcut to earning more profits through ethical misconduct, Dr. Anita Shantaraman quoted, ‘Managing profits is like playing tennis with your eyes on the scoreboard and not the ball.’ It is essential for any business to be ethical in order to be sustainable. Any profits that follow through unethical practices will eventually come out in the open and cause the business to crash. After an insightful discussion with the speakers, students were keen to ask questions and seek more perspective. The event concluded with a round of applause and a reinforced sense of fairness, responsibility, loyalty and commitment among the students. 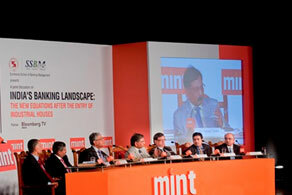 Mint Clarity through debate ‘New Technologies set to give banking a Facelift: What CIOs should do? Information technology may be at an embryonic stage but it has the promise of changing the face of the banking industry as not only enables banking services but also has the potential to be the driving force behind the perceived transformation. New entrants are leveraging their existing strengths of understanding the technologies and markets they operate in to deliver innovative business models which focuses on delivering business value. The theme for the Mint Clarity through debate ‘New Technologies set to give banking a Facelift: What CIOs should do?’ held on 29th August 2012 partnered by Symbiosis School of Banking & Finance considered the changes expected in the banking industry. The audience had an opportunity to witness the growth in this area by private sector players through interactions between the eminent panellists. There was a very lively discussion on how the banks had evolved from the teller system to the era of application. There was a consensus on how the new technology is going to change the face of banking in the future in order to cater to the new age customer who demands his business at hand while also ensuring that there is no lapse in security of his account. The discussion enlightened the present audience on how each bank was combating the rise in technology and how it planned to reach the unbanked. Tamal Bandyopadhyay, Deputy Managing Editor, Mint played the effective arbitrator in trying to point how the technology while being helpful to mankind also had some pitfalls and invited the bankers to share some real life experience of frauds that they had come across in their careers. He also envisioned the role of the regulatory body RBI in the governing of the use of technology and there was consensus on how the RBI is playing a very vital role in keeping a control over the misuse and abuse of technology. The discussion held the audience in such rapt attention which was evident in their queries put forth to the eminent panellists in the future of banking, the role technology would play in it and how it would aid in the process of financial inclusion. One thing in consensus from the evening was that there would be shifts in the banking industry like never seen before and far reaching effects that certain technologies would have from a perspective of customer centricity, speed of delivery and expense of servicing customer. Symbiosis School of Banking & Finance hosted a seminar titled “Insights and Foresight” on July 7, 2012. The theme was the challenges and opportunities to be faced by banking sector in the years to come. Dignitaries like Mr. Sunil Shirole, MD, Yen Capital Advisory and Mr. Anil Keskar, Dean Academics, Symbiosis international University also graced the occasion with their presence. We were privileged to have bankers from ICICI bank, Yes Bank, State Bank of India, Bank of Maharashtra, and Bank of India as audience. It also gave us an opportunity to interact with our sister institutes. “You can’t blend in when you were born to stand out”- R J Palacio. This was the theme of Aarambh 2018, which was conducted on 21stof July. The whole event portrayed how everybody should embrace the ‘Misfit’ in them. The show was orchestrated in the jam-packed SIU auditorium. Even before the show started, the energy and excitement in the auditorium was palpable, which was maintained at that level throughout the evening. The event kicked off with a powerful entry by the hosts onto the dais. After a round of quirky introductions, the chief guest, Dr.Ruchi Jaggi, Director, SIMC addressed the gathering and was felicitated. The first performance of the evening was staged by the students of Symbiosis School of Banking and Finance. The skit and dance that the team put up carried an important message in accordance with the theme. SSBF, without doubt, gave a great opening to the show. This was followed by many entertaining and meaningful performances by students from other institutes of the university like SIBM, SIMC, SITM, SSP etc. The best part of the evening came when the students of all the colleges of SIU came together to give a band performance. They created something truly mesmerizing on stage and the show got its perfect climax. Aarambh is an SIU cultural event that is organised every year by the various student committees from all the institutes of Lavale campus. Every year, the students of SIU eagerly look forward to this event which provides them with a wonderful opportunity to display their extra-curricular skills. The theme for Aarambh 2017 was ‘Unity in Diversity.’ This year, we at SSBF, came up with a unique concept - racial discrimination and stereotyping. It is a harsh reality that a multicultural and highly diverse society like ours, is rather hostile to the foreign students staying in India. So, to tackle this sensitive issue, we decided to generate awareness about it through a compelling story of a foreign exchange student staying in India, who has to confront the stereotypes deeply entrenched in the minds of the people. The skit was supported by captivating and power-packed performances by the students, who took the event to an entirely different level. The skit ended on a tragic note, with the narrator urging the audience to refrain from discriminating people based on caste, colour, creed, religion, gender or race. The story sent a powerful message, ‘Do not judge the lot, based on the actions of a few’, which successfully struck a chord with the audience. Like every year, the SSBF students stole the show and succeeded in winning the hearts of all the students of SIU with their scintillating performance. Every session at Symbiosis International University, Lavale Campus, starts with the fest Aarambh, for freshers. What better can a start to a whole new academic year be, than to have a platform to showcase your extra-curricular talent! This year the theme for the event was “Be the Difference”. We at SSBF, chose a very usual topic of Drugs, however, to show something extra-ordinary with a lot dance, drama, emotions and music to blow away the minds of the audience. Based on a contemporary dance performance, we portrayed the story of a decent young guy and his normal life blended with drugs. We went on to show how his deadly habits got him close to death and how he comes out of it, only to help other people see the brightness of the world. 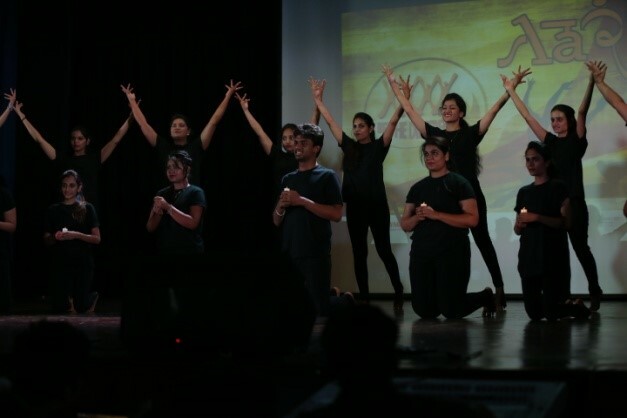 The dancers swayed away the hearts of the audience with their stunning moves and splendid confidence, and like every year, SSBF left its mark on the Aarambh stage. 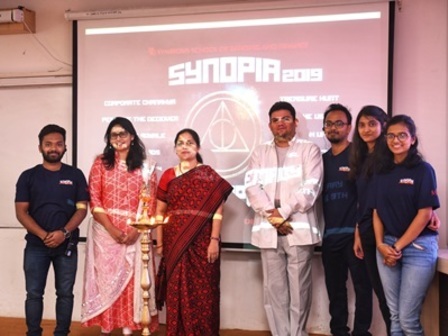 Synopia 2019, the annual cultural and managerial fest of SSBF was organized on 8 and 9 January, 2019. The theme of the event this year was ‘Elixir of Supremacy’. The fest, which was a huge success, saw enthusiastic participation of students from many different colleges and institutes. The events held on the first day of Synopia were Corporate Chanakya, Treasure Hunt, Human Fooseball and Mini Militia. In Corporate Chanakya, a core management event, the students were tested on their understanding of stock markets. The second event for the day, a treasure hunt, had the various participants scrambling for clues. Mini Militia was an interesting competition based on LAN gaming while Human Foosball was a game just like the classic table top Foosball, however, it was played with real people, a soccer ball in a large enclosed arena. The second day of Synopia 2019 was as exciting, eventful and fun-filled as the first. The day had four main events lined up namely; Perceive the Deceiver, What A Click, Speak Up and Battle Royale. Perceive the Deceiver tested how creatively contestants could use word play to guess the answers to questions displayed on a screen. What A Click, a photography event which tests the creativity, ingenuity, vision, innovation and capturing skills of all the budding participants. In Battle Royale, the third event for the day, participants had to pass four stages of different tasks to earn points. The face off round was a real treat to the eyes. The last event, Speak Up consisted of two rounds – JAM and Switch. The abstract topics tested the creativity, imagination and humour of the participants which had everyone is splits. 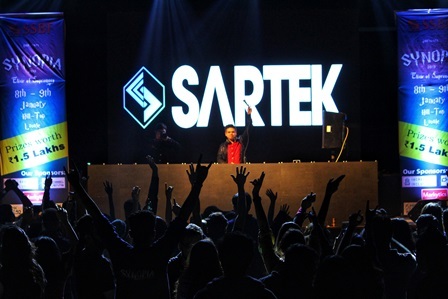 However, the high-light of the day was the DJ Night which had the entire crowd sway to the tunes of DJ Sartek. The great blend of progressive and electro dance music ended the two day cultural extravaganza in an electrifying way. The fest made a mark not only in the university but also showcased the hard work, dedication and zeal of all the students of SSBF. The annual cultural fest of SSBF is a colorful extravaganza where students get a chance to showcase and hone their innate talents and let their hair down. From singing to dancing to poetry to stand-up comedy to plays– all types of art forms find their fair share on the stage. 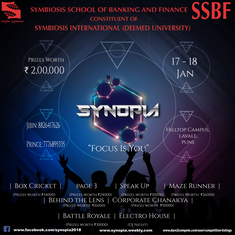 Synopia , the annual cultural and managerial fest of SSBF was organized on 18 and 19 january 2016. The fest was a huge success and added another feather to the cap of SSBF, increasing its glory. Their were rainbow of events ranging from core managerial events like Corporate Chanakya, to Tadka of Bollywood“ CINEBUZZ” and not to forget the heart rendering and mind blowing “ Battle of Bands” and “DJ Night “. There was a wide number of participation from students of different institutes which demonstrated how well received the fest was. The fest made a mark not only in the university but also showcased the hard work, dedication and zeal of all the students of SSBF. SYNOPIA, the annual cultural and managerial fest of SSBF was organized on 18 and 19 January, 2017 along with the second edition of the Entrepreneurial Summit- IMPRESSA 2017. The event was a huge success, and it rightly added to the glory of SSBF. 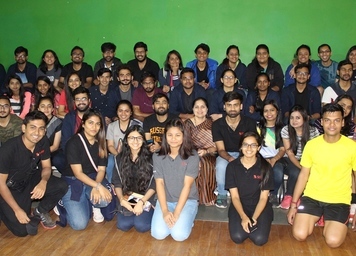 From the core managerial event Corporate Chanakya, to the Tele-Quiz FRIENDS' Trivia, from the mysterious 'Treasure hunt' to the sports event 'Futsal', all the events left the participants with great excitement and joy. 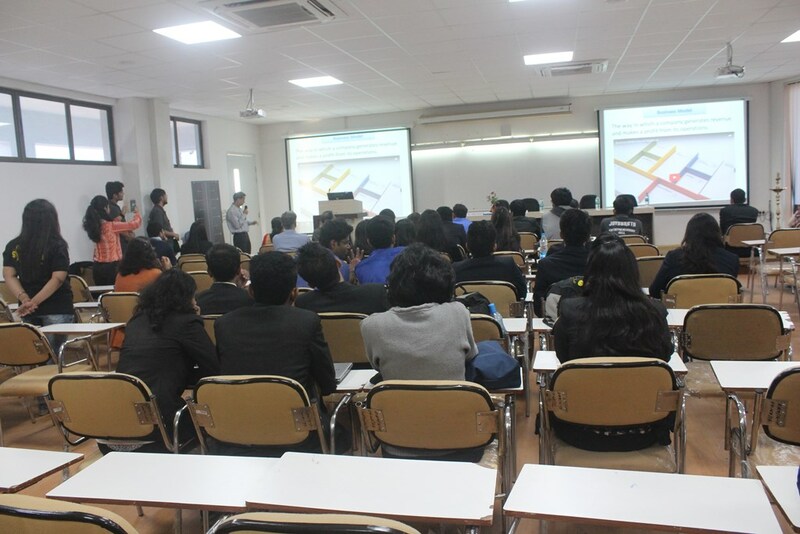 The E-summit IMPRESSA, featured a series of events which included a guest lecture, panel discussion, and Inter B-Plan competitions. Synopia was followed by an enthralling VH1 Supersonic Night leaving SSBF's mark not only in the university & it's sister institutions but also on other colleges of PUNE from where huge participation was received. SYNOPIA 2017 was a platform for the students of SSBF to showcase their hardwork, zeal and dedication. SYNOPIA is the annual cultural and managerial fest of SSBF and was held on 17th and 18th January, 2018. The event which was a huge success, saw the enthusiastic participation of students from many different colleges and institutes. The events held on the first day of Synopia were Corporate Chanakya, Maze Runner, Behind the Lens and Box Cricket League. In Corporate Chanakya, a core management event, the students were tested on the basis of their corporate, management and innovation skills. Maze Runner, a treasure hunt had the various participants scrambling for clues and also included a round which tested the trust they had on each other. Behind the Lens was an outdoor photography competition in which the students explored the campus, captured some beautiful pictures and submitted their masterpieces within a few hours. The theme for the competition was “Beautiful Blur”. The last event for the day, Box Cricket League was a slightly modified version of gully cricket. Overall, the event turned out to be very successful. DAY 2 The second day of Synopia – 2018 was as exciting, eventful and fun-filled as the first. The day had three main events lined up namely, Page-3, Speak Up and Battle Royale. The first event tested the Bollywood knowledge of the participants. The questions covered various genres like Politics, Drama and Mystery and had both the participants as well as the audience at the edge of their seats. Speak Up, which was the second event for the day consisted of two rounds – JAM and Switch. The abstract topics tested the creativity, imagination and humour of the participants which had everyone is splits. The last event, Battle Royale saw some scintillating dance performances by individuals and teams. The face off round was a real treat to the eyes. However, the high-light of the day was “Electra House” which had the entire crowd sway to the tunes of International DJ Nina Suerte. The great blend of progressive and electro house music ended the two day cultural extravaganza in an electrifying way. 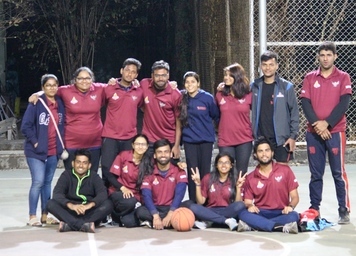 SANGRAAM is an annual intra-institute event organised by the Sports Committee of Symbiosis School of Banking and Finance, usually where the junior and the senior batch participate in a variety of sports ranging from Badminton to Volleyball to Cricket to Basketball. Everyone, including the students, the faculty as well as the staff, looks forward to playing in Sangram every year, not only because it provides a break from the mundane routine of classes, presentations and projects but also because it refreshes our minds, help us enhance or maintain our physical health and also to get to know each other outside of the college environment. On the 25th of January, the sports committee of SSBF successfully concluded their flagship event Sangram 5.0. It was flagged off by Dr. Manisha Ketkar, Director, SSBF on 23rd. The tagline of the event was “Battle between the best”. And it truly was. 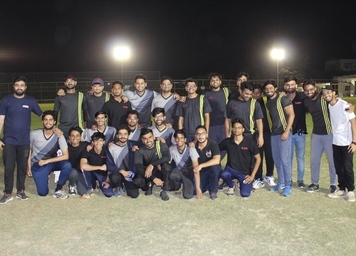 The senior and junior batches competed fiercely across various games like cricket, football, badminton, throwball, volleyball and basketball over the span of three days. It wasn’t just the students who participated; there was active participation from the faculty and non-teaching staff too. They were neck and neck with the students in various events, which made the event even more interesting. 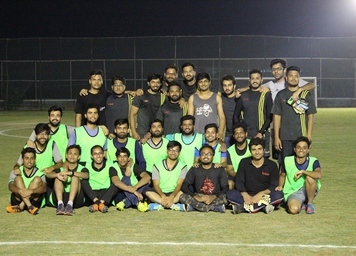 The Box Cricket League, an IPL style cricket tournament, was undoubtedly the biggest attraction of the event. It was played between eight teams over three days. Unlike other games where juniors and seniors competed against each other, the teams were a mix of both batches. Overall, the event was a huge success. It reiterated the fact that life at SSBF isn’t all about academics. The focus is on overall development of a student. The purpose of the event isn’t just to serve as a source of recreation for the students but also to inculcate values like team spirit, cooperation, etc and the sports committee goes an extra mile every year to ensure that the purpose is served. SSBF sensitizes its students towards society. For it, students have formed Corporate Social Responsibility committee. CSR committee conducts activities like financial quiz, exposure trip of underprivileged students; interaction with HIV affected children in consultation with various non-profit organizations. In line with it, SSBF has made a space for these kinds of activities in its curriculum. We have “Minor Project”, a course dedicated to provide exposure to the students about financial conditions in underprivileged society. Under it, we have covered issues like financial awareness, financial inclusion etc. in nearby villages. This year, a group of students visited BAIF, a leading NGO in the country. They visited BAIF’s center at Uruli Kanchan to see their Micro Insurance, Micro Finance, and Training Programme. Another group of students visited R-SETI of Bank of Maharashtra to gain exposure of training programme customized for underprivileged women. Two more issues covered were Financial Inclusion, and CSR. For Financial inclusion, students went to rural as well urban areas and conducted a survey to gain understanding of topic under consideration. For CSR, students took the view of bank employees and customers to gain their understanding about it through survey. After visiting RSETI- Hadapsar, I got to know about the steps Bank of Maharashtra has taken to uplift the status of poor and needy people. BOM conducts many training programs which is helpful for many people. I wish all the best to the Organization. "It was a very good experience, visiting BAIF at Urali kanchan. I have learnt lot of things about micro finance, how is it practiced in the SHGs, and how they get benefitted from micro finance. It helped me gain knowledge that would help me pursue my MBA in a better way. Mr. Shashank Mokashi is not only an amazing organizer of BAIF, but also a very good teacher. I got to learn about BAIF's importance and many other enlightening things from him. We also spoke to few members of SHGs. Those women spoke about how they manage their SHG. I was amazed by the confidence levels these women have. Overall, it was an amazing experience. Wish we could have got more time to do some more extensive research on BAIF." ''Khushi'' is another annual event conducted by CSR on World AIDS day, where SSBF students spend a day and spread cheer to an orphanage ‘MANAVYA’ with HIV afflicted children .We bring this children to our campus and give them the lack of Interaction and love that they miss. From past two years Khushi event has made to smile these children and in turn our Students have realized the value of life .These children face lack of love and affection, but SSBF has been making continuous attempt to spread love and bring enthusiasm among these children and giving them a hope of ray to stand strong in the society. Spending a day with them is not our goal but to learn a bit from them and in turn educate them regarding the well-being in society is the main aim of our Students. ''Manavya'' is another annual event conducted by CSR on World AIDS day, where SSBF students visit and spread cheer in orphanages with HIV afflicted children. The event is an attempt to include AIDS inflicted into mainstream society and help bring a smile on their faces, raising awareness about the dreaded disease in the process. 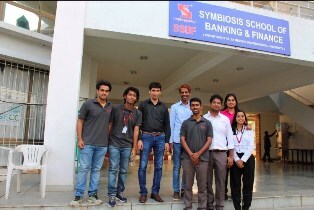 20th September is marked as the foundation day for Symbiosis school of banking and finance. This day comes up with exciting nostalgic moments when all the students reflect not only the beginnings of the college but also focus on remarkable development that has been experienced over the years. It is a day which is set aside to thank all our founders and appreciate their efforts in making our surroundings well connected. The tradition of starting any programme with Ganesh Puja in India is said to be auspicious and for us it was no different. The programme started at this note creating a positive aura at the initial stage. The day became more energetic by experiencing startling performances by the students. The passion and zeal of the audience as well as faculties created the ambience more colourful and livelier. It is the day where every single employee, students, staff and faculties unite and celebrate the success of the journey over the years. The end of the programme made us realize that embracing the things we love is important and plays an important role in respecting the same. With all the memories captured in cameras and our cognitive minds we all left the programme at a positive note. “The journey of thousand miles begins with a single step” is a well-known saying. Seven years ago, Symbiosis School of Banking and Finance (SSBF) was established and since then there has been no looking back for this institution. On 6 th September, 2017, SSBF celebrated its seventh Foundation day to commemorate the beautiful journey of these seven years. The arrangements were remarkable, with resplendent rangolis adorning the premises of SSBF. The Assembly Hall was also decorated beautifully with balloons. The event began with welcome address given by our esteemed director Dr Manisha Ketkar, motivating the students to take SSBF to soaring heights. She gave us an invaluable takeaway- “Be humble, be grateful.” A video was made by the students, which revived those lovely moments spent at the campus which was followed by a cake cutting ceremony. To make this event even more memorable, some activities like ‘Riddles’ and ‘Pass the parcel’ were designed especially for the faculty members, who really enjoyed it. This was followed by a mesmerizing musical performance, mimicry and stunning dance performances by the junior and the senior batches, which succeeded in swaying the hearts of the audience. However, just like all good things, the event had to come to an end too. The event was a great success, and it reflected the love, dedication and support of the entire SSBF family. 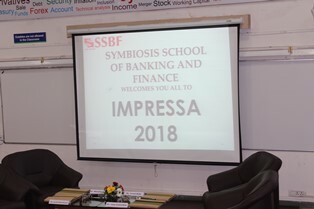 The entrepreneurship cell of Symbiosis School of Banking and Finance organised their annual event Impressa on 12th January 2018. The event which had a host of events, saw active participation from not just the students of SSBF but from the other colleges as well. The first event, a panel discussion on the topic “Harnessing the innovative mindset” gave the students an insight on what entrepreneurship actually is. The panelists, Mr. Vikas Khanvelkar, MD and CEO of Design Tech, Mr. Kunal Maheshwari, Co-Founder of Superbowl and Mr. Vineet Sethi, Co-Founder of Bagtalk.com stressed upon the 5P’s of entrepreneurship i.e. Purpose, Passion, People, Proposition and Persistence. Each of the panelists also narrated the story behind their venture and explained the learning outcomes. The panelists did have differing views on some aspects, but, one thing that they unanimously agreed upon was the fact that it is imperative to know the industry that one is venturing into like the back of one’s palm. Following this informative session, the students were given an opportunity to try their hand at developing business plans. 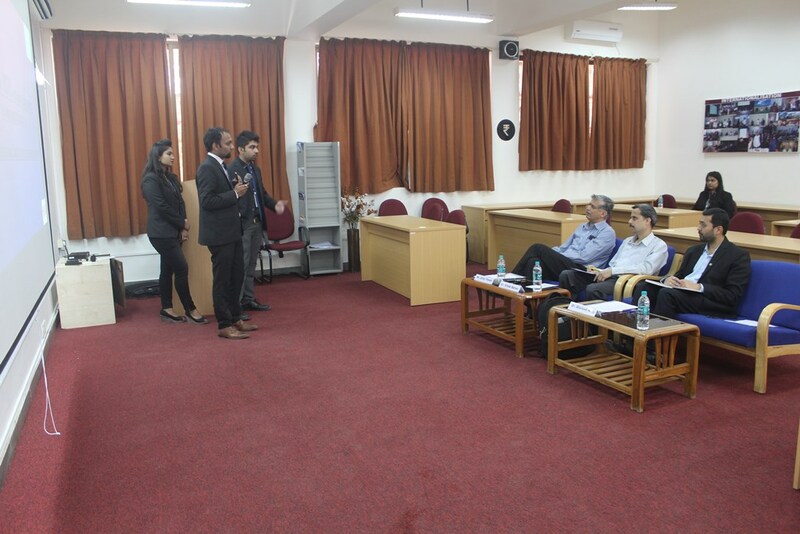 The event, “Synovate” which saw teams from IIM-Indore, XLRI-Jamshedpur, K J Somaiya, IMI Delhi, SIBM-Pune, Jamnalal Bajaj etc was a platform where the students could come up with new ideas and also get suggestions to improve upon it. The first, second and third places were bagged by teams from SIIB, SIBM and MISB Bocconi respectively. The committee also organised an eCash Policy Innovation Challenge (EPIC) to see if students can come up with an innovative idea to solve the problem of a delay in digitisation. This was won by teams from SIBM and SPJIMR. Apart from this, the students got to set up stalls and display their entrepreneurial skills. Overall, the event was very informative and successful. Impressa, the annual flagship management event of Symbiosis School of Banking and Finance, held on 19th January 2017 and organized by Entrepreneurship cell of SSBF impressed everyone out there with the extravagance of its events. Participation from various institutes across India made the event a great platform to compete with each other. The two main events of impressa i.e. SYMPODIA and SYNOVATE tested the analytical and business skills of the participants. SYMPODIA was the first event of Impressa which was an online quiz. Unlike other online quizzes, SYMPODIA broke the monotony of the cliché online quizzes. This quiz consists of 20 questions and each question has three figures, the common thing between the figures was the answer to the question. The twist was that the answer to a question was password for next question. The zeal to unlock the next question kept the participants engrossed in the quiz and motivated to brainstorm further. The participation this year was more than 150 in SYMPODIA and the positive appreciating feedback from all the participants showed us the success of the inaugural event of IMPRESSA. The event by Entrepreneurship cell would be incomplete without a guest speaker for the budding entrepreneur. The skills of an entrepreneur can be best explained by a person who has experienced all of it. We were privileged to have Dr. Vivek Barve between us to give a speech for budding entrepreneur. Dr. Barve is an entrepreneur who is a co-founder of a company “Accures Legal”. Accures legal assist clients in all fields of intellectual property including patents, trademarks, copyright, designs, plant variety protection, geographical indications – from its development to its monetization. The speech was about the risk and planning an entrepreneur needs to do and different dimensions of business. 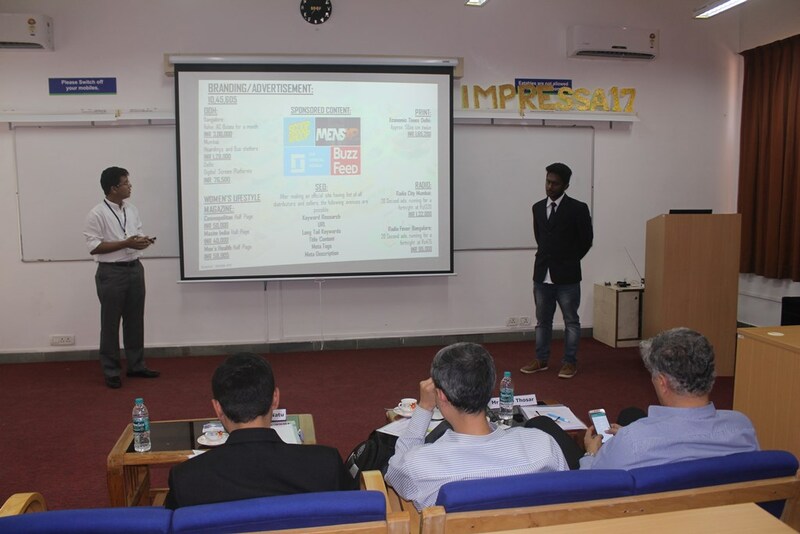 Impressa was concluded by the event “SYNOVATE – the Business plan competition “. Across India many teams registered for the event but 9 teams qualified for the finals after the preliminary round. The event was judged by Dr. Vivek Barve, Mr. Dilip Thosar and Dr. Shailesh Natu. The teams presented their business ideas in the form of a PowerPoint presentation. They were appreciated, advised and given constructive feedback by the judges. Judges provided some of the participants with their contact, so that they can get some help in starting up their ventures. Impressa is growing year by year and the expectations of people becomes the motivation to make it even better. The efforts of Entrepreneurship cell under the guidance of Dr. Shailesh Natu made the event a great success. Recognizing the need for harnessing the entrepreneurial spirit, the Entrepreneurship cell of SSBF organized its first Entrepreneurial Summit “Impressa“on 26th September, 2015. 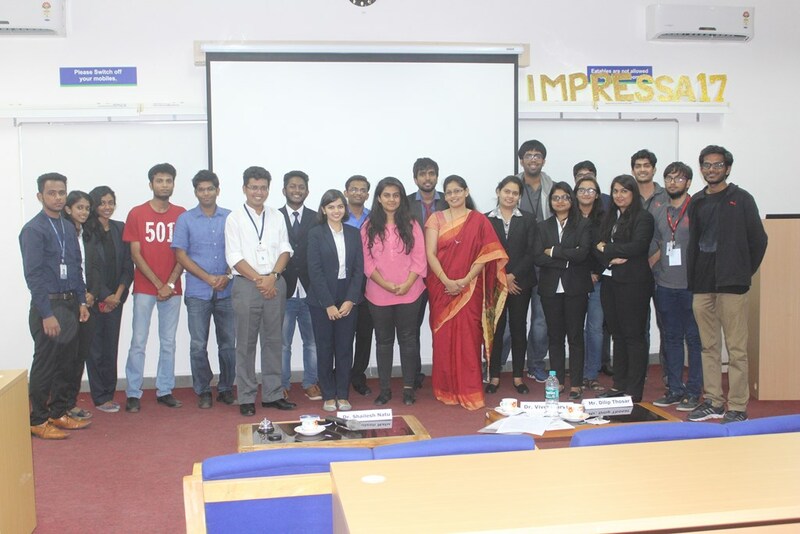 Based on the theme “Harnessing the Innovative Mindset”, the summit featured a series of events which included a guest lecture, panel discussion, a workshop and 3 Inter B-school competitions. 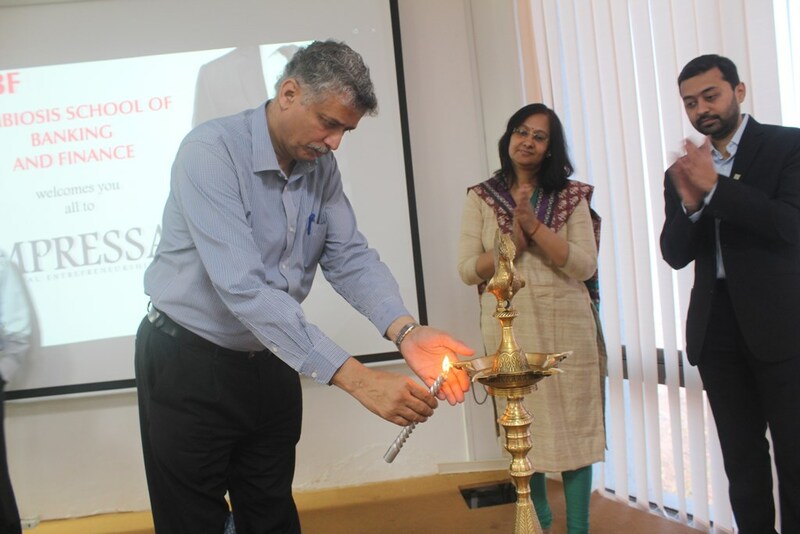 The summit was inaugurated with the lighting of the lamp and welcome address by the Deputy Director, SSBF. This was followed by a guest lecture by Mr. Rohan Chhazed, AVP, Zoomcar India Pvt Ltd on Business Startup Strategy. He spoke of the importance of understanding the value proposition that an entrepreneur presents to his customers as well as the importance of market share capture. It was a very interactive and informative session and Zoomcar goodies were distributed to the students. An impromptu contest was also held where the students of SSBF impressed the guests with their ability to devise marketing plans. This was followed by a workshop on trading in financial markets, conducted by Mr. Purv Shah- Member of BSE Stock Broker’s Forum. 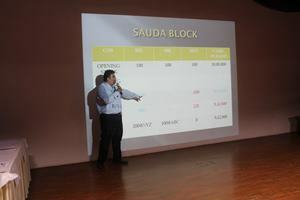 Mr. Shah explained the nuances of trading in stocks and shares and kept the audience hooked with his presentation. The highlight of the Summit was a panel discussion on the theme –“Harnessing the Innovative Mindset.” The panel comprised of young and dynamic entrepreneurs and executives. The panelists included Mr. Manish Harodia, Founder of Dreamwallets; Mr. Mihir Badiani, Launch Manager, Swiggy; Mr. Purv Shah, Member of BSE Stock Broker’s Forum; Mr. Heramb Nargundkar, Director and Founder, Efact Solutions and Mr. Rakesh Das, Cofounder, Instainnovations India. Each of the panelists shared their experiences. The most important fact they highlighted was that there is no set route to success, and each entrepreneur must find their own path. The importance on disruptive technology and businesses was touched upon, and the need for an entrepreneur to be even more unfazed by failure than other professions. One thing to remember is that entrepreneurship requires iron certitude and that it is best to enter only if one is absolutely sure of pulling it off. 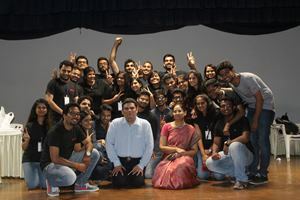 Apart from these, the E-Cell organized three exciting events for the B-school participants. All three events received large number of registrations from across India. The finalists for Synovate and Symulate were selected on the basis of online test and submissions. There were a total of 10 teams who made it to the finals of Synovate and seven participants who made it to the finals of Symulate. Finals of both these events were held at SSBF. 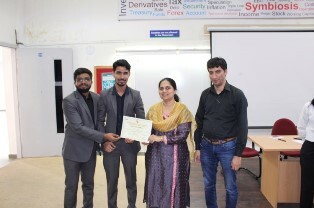 Team Achievers of CSS National Institute of Agriculture, Jaipur won the first prize and Team Vcare of SIBM Pune won the second prize in Synovate. Amit Shirude of IIM Indore (Mumbai Campus) and Karthikeyan N.B. 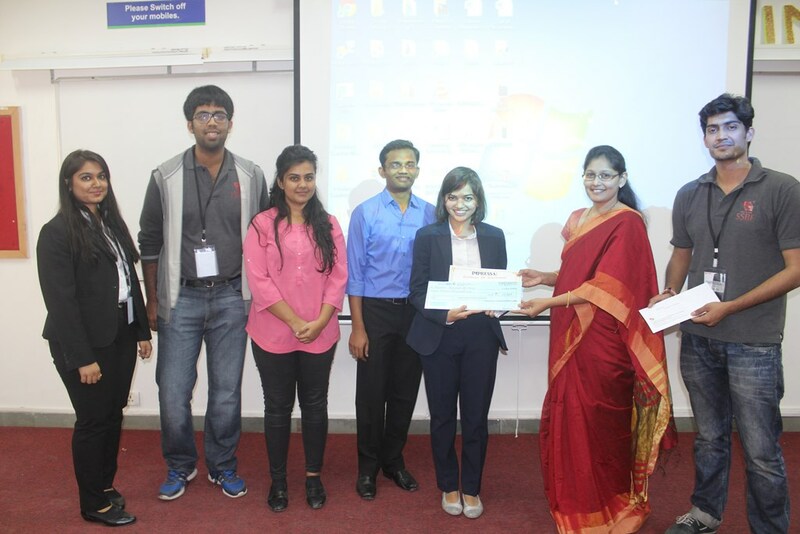 of IIM Indore (Mumbai Campus) won the first and the second prize respectively in Symulate. “Sympodia” was an off-campus event where participants participated in an online puzzle solving exercise, which involved hunting clues across a variety of images. Dinesh Gupta of International Management Institute, New Delhi won the first prize in Sympodia and Priyanka Lunawat of Wellingkar won the second prize. The event was sponsored by Zoomcar India Pvt. 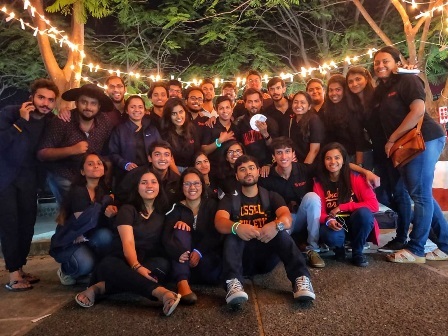 Ltd. and Swiggy, who also joined the discussions and guest lectures. The event was a great success and we at SSBF look forward to seeing you all at Impressa 16! The warm morning of 25th September 2015 witnessed excitement, enthusiasm and passion running through the veins of the students of SSBF. As a part of its PR initiative, Symbiosis School of Banking and Finance organized its first ever virtual stock trading workshop and competition: “Dalal Street Arena” on 25th September 2015 at Symbiosis Vishwabhawan, S.B Road, Pune. The event was designed to create awareness and improve the knowledge of the participants relating to the functioning and operations of the stock markets. 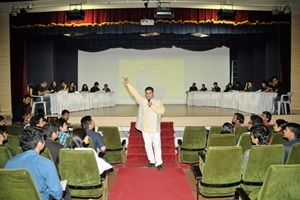 The participants were undergraduate students of various colleges across Pune and Mumbai. Registrations were received from colleges like MITSOM, Indira and BMCC to name a few. 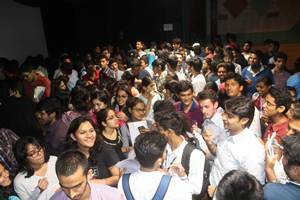 A total of 80 students participated in the event and about 30 on spot registrations were recorded. The event was conducted in two slots. The morning slot involved a talk on career goals and aspirations by eminent entrepreneur in the field of financial advisory Mr. Purv Shah. In the second slot, a virtual trading ring was created where students were asked to trade in stocks keeping in mind the various market forces. At the end of the event, winners were announced on the basis of highest portfolio value and highest intraday gains. They received cash prizes worth Rs. 10000 and certificates. 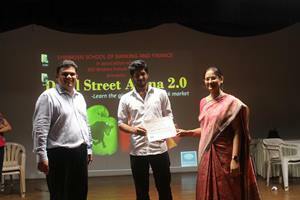 Dalal Street Arena turned out to be a huge success and worth every effort put in by the volunteer students of SSBF. All the participants and volunteers had an intellectually stimulating experience and went home better informed and more learned about the secondary market. The whole purpose of the event to raise awareness regarding the volatility of the stock market and its importance in shaping the economy was very well achieved. Inspired by the grand success of Dalal Street Arena, the PR Team of SSBF plans to target students from across the country next year, to have a pan India impact. 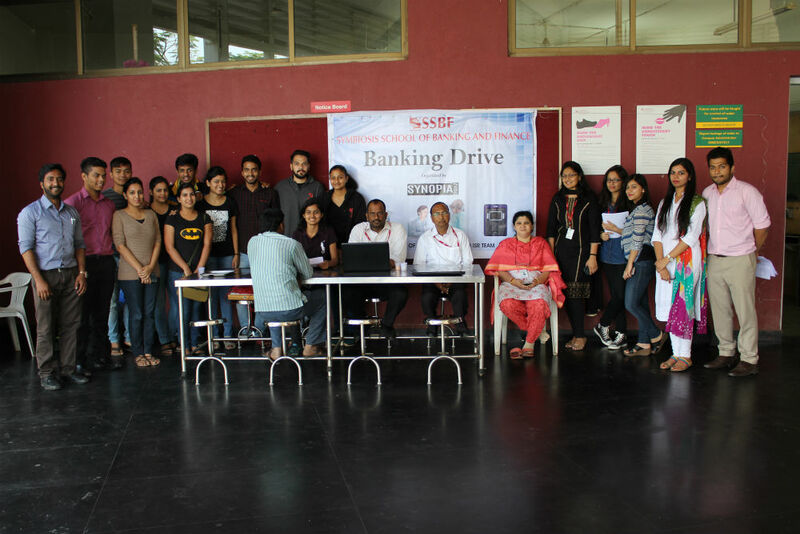 On the 9th of September 2016, Symbiosis school of Banking and Finance had organized a mock stock event called DALAL STREET ARENA 2.0.which was held at Symbiosis University, Senapati Bapat Road at the SYMBIOSIS VISHWABHAVAN AUDITORIUM. Students from various colleges came to take part in this event. Participants were mostly from Poona College, Marathwada Mitra Mandal College of Commerce (MMCC), Singhad Institutes and Symbiosis Institutes to name a few. They were welcomed by the volunteers and guided towards the registration desks at sharp 9:50 AM where they also received a notepad, pen and a customized keychain. The resource person for the day was MR.PURV SHAH, freelancer at the BROKERS FORUM and who was felicitated by Mrs. Manisha Ketkar, Director of Symbiosis School of Banking And Finance. The first session was regarding the career opportunities provided in the financial sector in today’s relevance which was then followed by a lunch and refreshments break. The second session started off at 2:00 PM with a small quiz round to lighten up the mood of the audience. And this was followed up with a session on stock exchange and its working. After the completion of the workshop the mock stock competition started where the participants had to apply the knowledge they received from the workshop and make use of it in this simulation. An Instagram boot was also provided for students to take pictures with. The winners of the event were Yogesh Mishra,Pooja Ridichatti, Anirudh Rao and Mohammad Kashan Azmi. The feedback received from the participants depicted the success of the event where students found this experience to be extremely fruitful and they would be willing to be a part of the event in the years to come. The Public Relations Committee of Symbiosis School of Banking and Finance, hosted their flagship event “Dalal Street Arena – 3.0” on 23rd November 2017. The event which was held at the S. B. Road campus, saw over 200 participants from various colleges in the city. The event started with a workshop by Mr. Purv Shah, a freelance entrepreneur in the field of investment advisory and training. The workshop, gave the students a fair idea about stock markets, trading as well as careers in finance. Having an experience of over twelve years in financial markets, he told the students that it is alright to make mistakes. According to him, one learns the best from experiences and emotions. This was followed by a “Mock Stock Exchange” where all the participants were traders and had to buy and sell shares from other fellow participants. There were constant news updates such as impact of GST on specific sectors, dividend declaration of companies and declaration of quarterly results. The students, based on these updates took decisions on whether to buy, sell or hold the shares. The competition ended with the person with the highest net worth winning. This year’s winner was Aman Kumar. The second and third places went to Rohan Jaiswal and Siddharth Arora for having the highest trading profit and least cash balance respectively. To say that the event was a huge success would be an understatement. “Dalal Street Arena-4.0” one of the flagship events of Symbiosis School of Banking and Finance was organized by Public Relationship team on the 11th of October 2018. 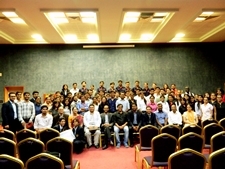 The event was held at S.B.Road campus. There were students from various campuses like BMCC, MMCC, Indira college, SCAC. The event started with a guest lecture by Mr. R Ravi Kumar who is a seasoned multi-faced consultant with over a decade of experience in finance, E- commerce, marketing, education technology, and talent development. The session gave the young minds idea about career and opportunities ahead in the field of Banking and Finance. Mr. R Ravi Kumar who has over a decade of experience told the students it’s alright to make mistakes, but shouldn’t stop following the dream. He also told that we shouldn’t celebrate too early in life. This was followed by the main event of the day “Mock Stock Exchange” where all the participants were the traders and they had to buy and sell among their own fellow participants. Along with this, there were constant updates regarding news of the companies that would lead to an impact on the share prices of the companies. So looking into all of this the traders had to see if they wanted to hold back the shares with themselves or sell it. Mock Stock Exchange process went on for an hour and a half, in the end, the winner was decided on the basis of a trader with maximum net worth with them. First place was won by Apoorv Joshi and second place was won by Ajinkya Deshmukh. All the students actively took part and made the event a big success. 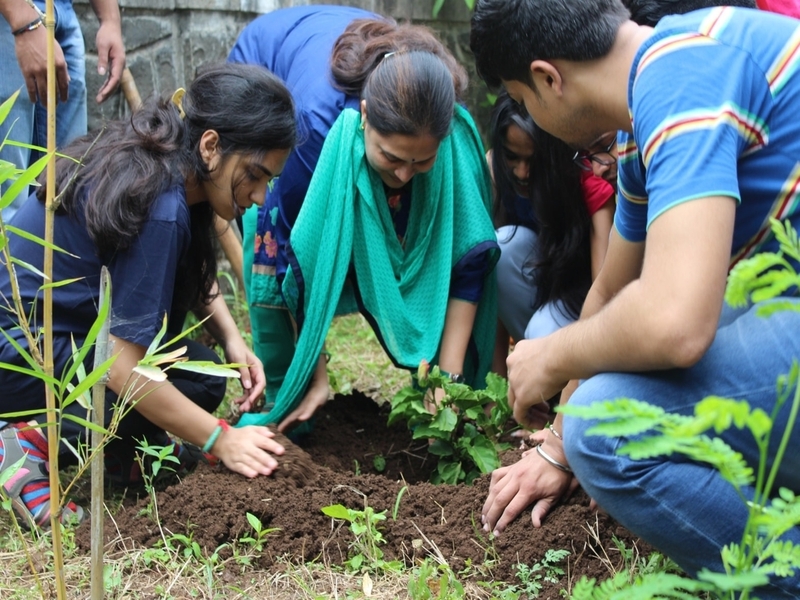 Tree Plantation Drive was held on 27th of August 2018, by students of Symbiosis School of Banking and Finance. 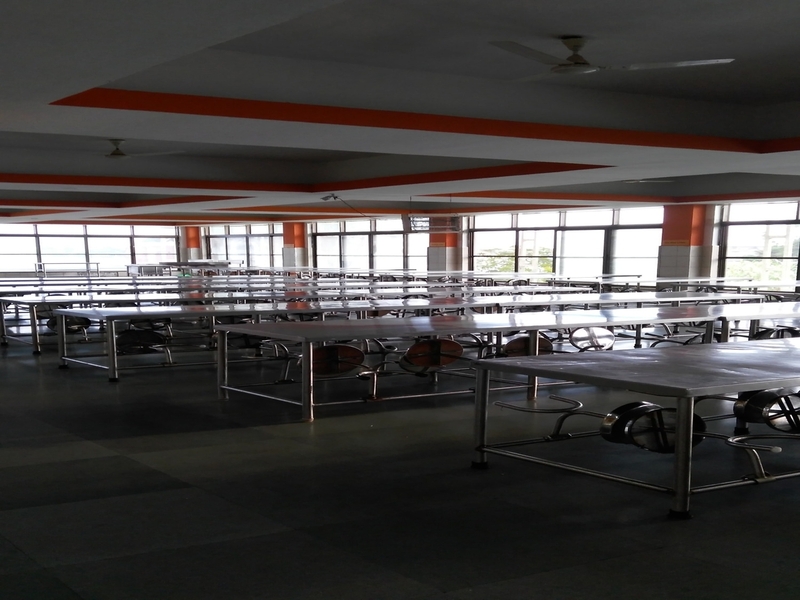 The Symbiosis, Lavale campus is filled with lush greenery and is a health promoting campus. The students, staff and management strongly believe in the coexistence of humans with the flora and fauna that the campus has to offer. The tree plantation drive showed that it is not important to plant trees only on Environment Day to keep the environment pollution free, but that this initiative can be taken up for a better life on a regular basis. 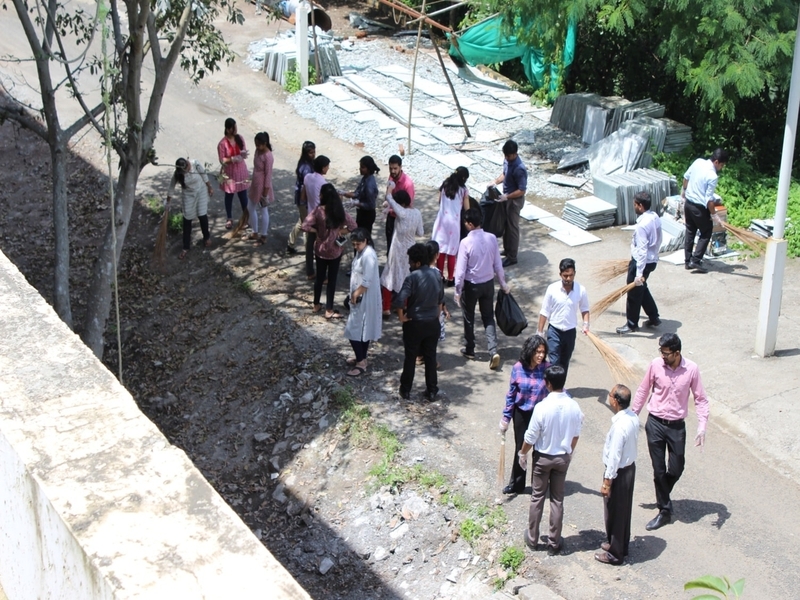 The students were taken to hill base of Symbiosis hills where they, along with the faculty and staff, assembled near the rain water harvesting reservoir. 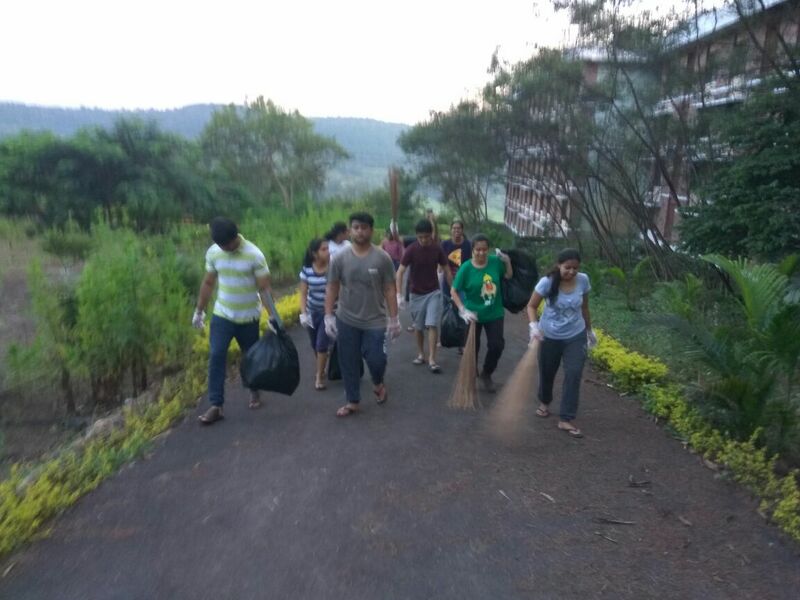 Next, they took a mini trek up the Lavale hills to plant saplings at various locations at the hills. 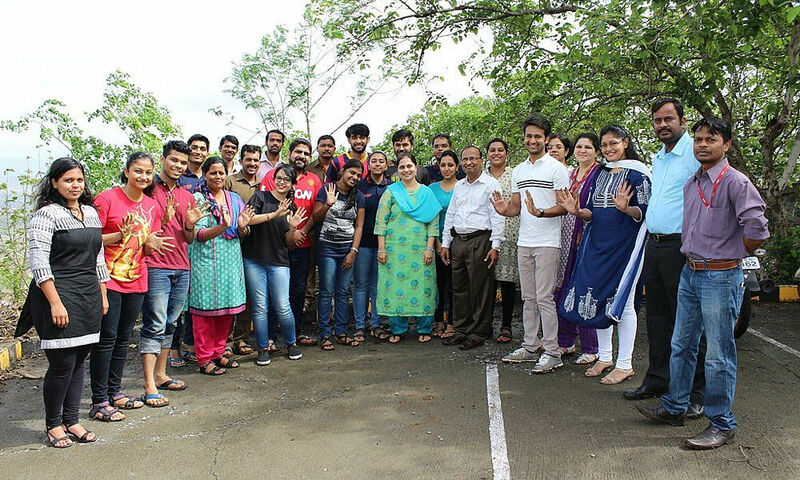 The drive had active participation of the students and director, Dr. Manisha Ketkar along with the faculty of SSBF. The event tells us that taking care of our environment and being responsible for it should be a part of life. Finally, there was a happy picture taken after a successful event. “There is no best time to plant a tree. It should be done as quickly as possible.” All of us have a duty towards the earth that is to sustain it’s greenery and to not destroy the trees that give us our basic need that we require for survival, which is oxygen. As the first initiative for the academic year 2016-2017, the ISR committee undertook a tree plantation drive on the 1st of July, 2016 in the campus itself at 9:15 a.m. 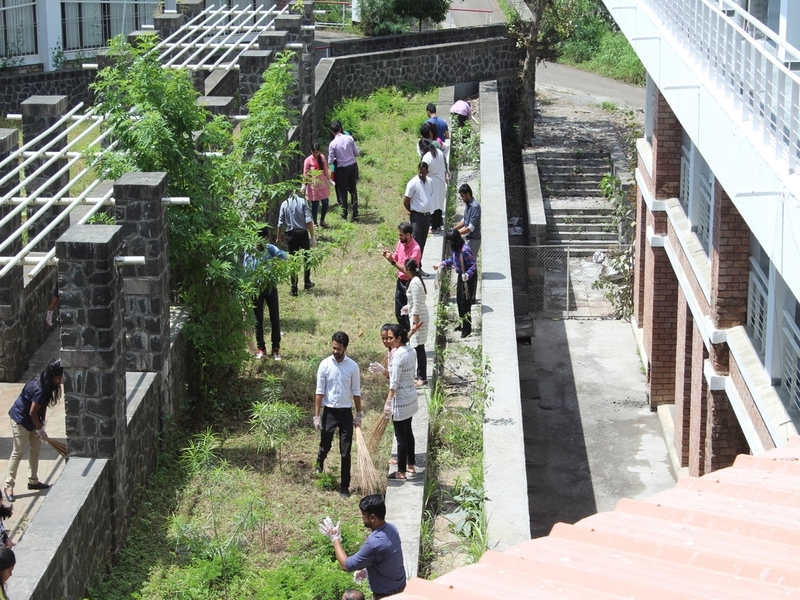 Trees were planted near the academic block and the parking space of Symbiosis School of Banking and Finance. All the faculty members, non-teaching staff and the director of the institute along with the students of the committee actively and enthusiastically participated in this drive. 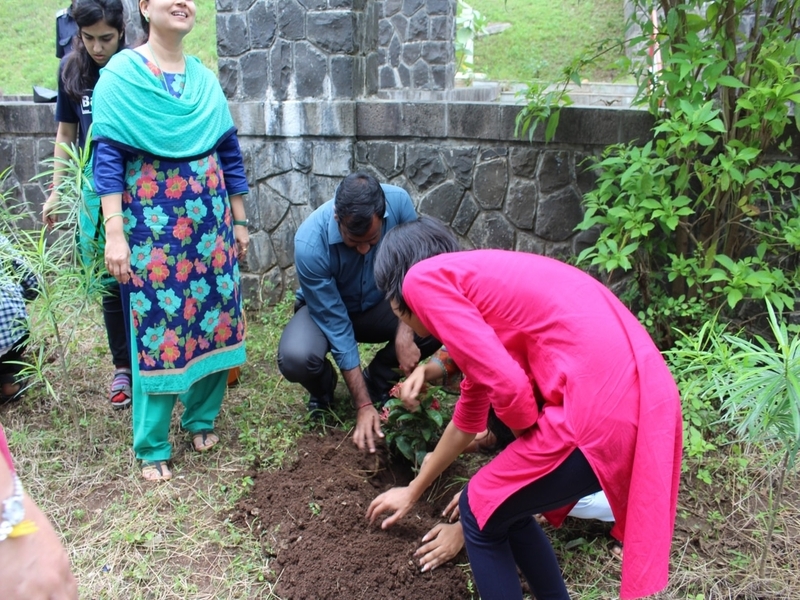 At 9:15 a.m. two members each from the junior committee and senior committee along with the head of the ISR committee, Dilip Sir went to receive our director, Manisha Ketkar Ma’am to flag off the tree plantation drive. The first tree was planted by our director ma’am and subsequently all the teaching, non-teaching and admin staff also planted the trees. First, the trees were planted near the academic block of the institution and later we all proceeded towards the parking area where two more trees were planted by the teaching faculty of the institution. 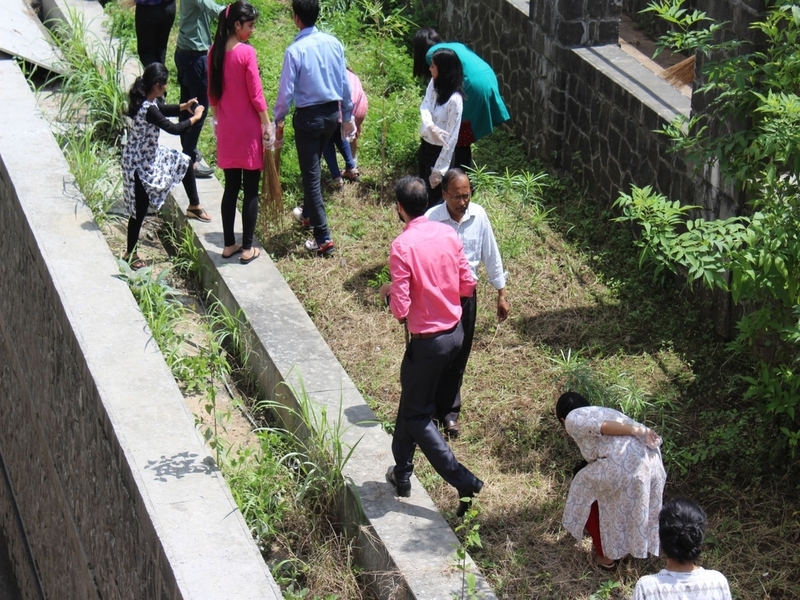 The ISR committee has taken upon itself to maintain and take care of the trees planted in the premises as a part of the social responsibility of the institution to contribute towards the greenery of this beautiful campus and also discharging our duty towards mother nature. After the plantation program, photos were clicked in order to cherish this beautiful memory. On behalf of the ISR committee, we would like to thank director ma’am, teaching, non-teaching and the admin staff who spared some time from their busy schedule, for their support and enthusiastic participation, which helped us make the first event of this academic year a great success. Report on the ‘Swachchhata Pakhwada’ initiative carried out by the Institute Social Responsibility committee at Symbiosis School of Banking and Finance. The ‘Swachchhata Pakhwada’ was the initiative of Maharashtra government to give a push to Swachh Bharat Abhiyan. Accordingly the Swachchhata Pakhwada initiative was to be carried out between 1st September 2017 to 15th September 2017. The Institute Social Responsibility committee of Symbiosis School of Banking and Finance focused on the campus cleanliness initiatives. The committee carried out the following events on the background of Swachchhata Pakhwada. This initiative was carried out on 11th September 2017 at the Hostels at the SIU Lavale campus. Along with the committee members many volunteers from SSBF also participated actively in the initiative. To undertake this initiative the committee members visited the mess and inspected the cleanliness and hygiene of the facility. This initiative was carried out on 13th September 2017. According to the inspection the mess is thoroughly cleaned thrice a day and the surroundings are cleaned twice a day. 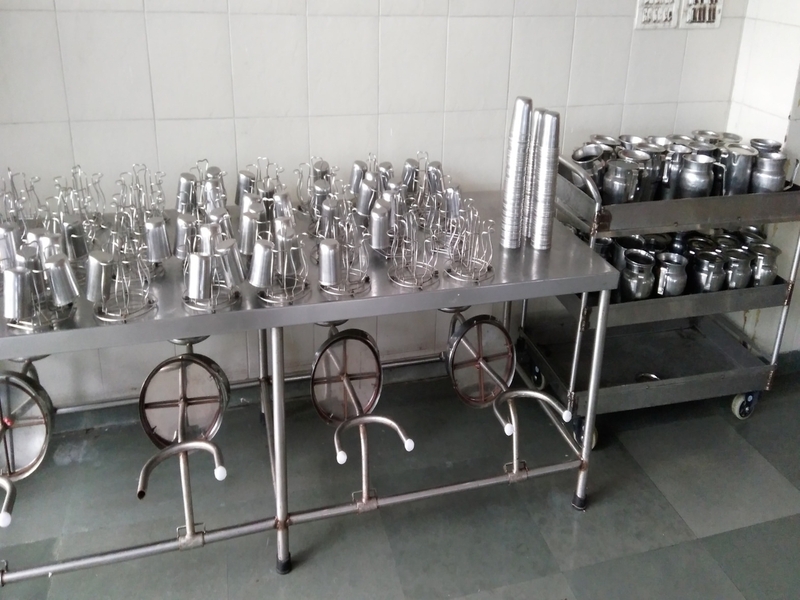 Cleanliness is given utmost emphasis when it comes to mess facilities at SIU Lavale campus. 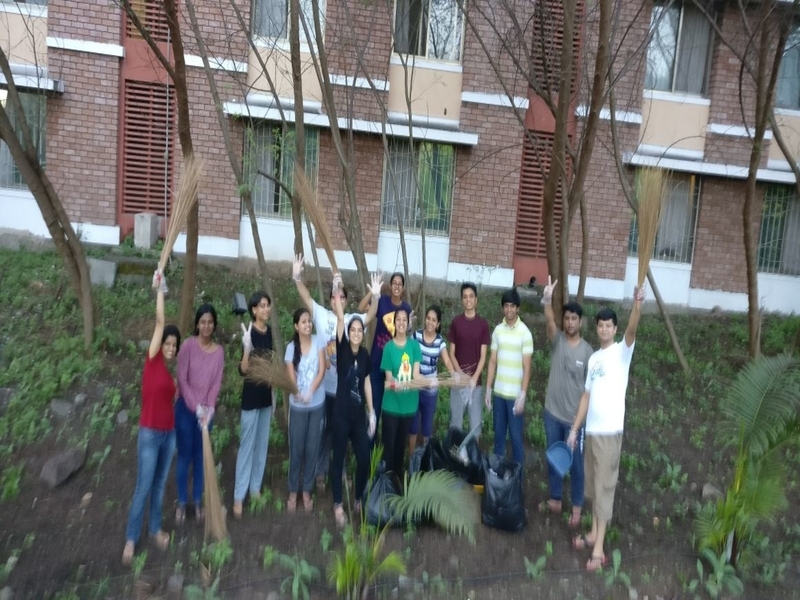 The Clean Campus Day was undertaken on 14th September 2017 at the Symbiosis School of Banking and Finance. 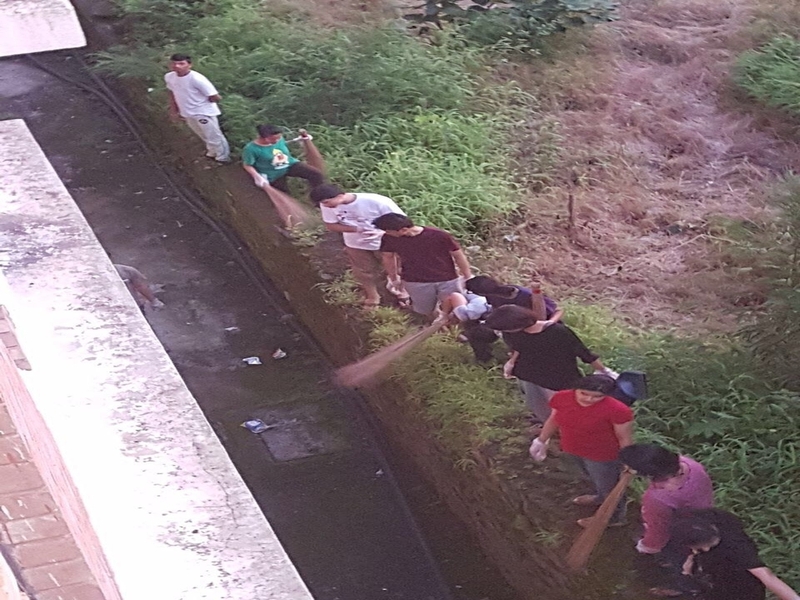 The surroundings of the college were targeted for this cleanliness initiative.